Spend a week learning Hawai’i’s traditional, spiritually-based healing art. Experience the beauty of the Big Island of Hawai’i, its culture, people and sacred sights. 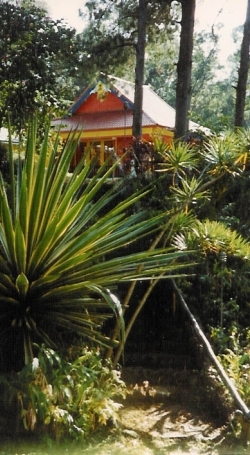 This course is designed for LMP’s who are proficient in Swedish massage and who are interested in a week-long study of Lomilomi Massage & the Hawai`ian Healing Arts. Introduce practitioners to a traditional, spiritually-based style of Hawai`ian massage that is fluid, heart-centered and holistic. Introduce practitioners to a deeper exploration of the Hawaiian Healing Principles and their application to healing the whole person ~ body, mind and spirit. Introduce practitioners to a variety of movement and meditation techniques, as well as fluid weight/leverage body mechanics for supporting long-term practice of massage. Introduce practitioners to the power and beauty of Hawai`i, as well as the Hawai`ian culture, teachers, and healing practices. Introduce practitioners to a deeper exploration of themselves as facilitators of healing. “You created a wonderful balance between culture, spirituality and bodywork. I wish there would have been more time for Hula, but I am inspired to take classes. I will never look at or experience Hawai`i in my old ways. I have a deeper understanding and higher appreciation for the people and their home. The elders you brought into our circle were amazing – they are all sparkling gems! My life has changed and I look forward to what is ahead!” Michelle L.
“I was very pleased by how comprehensive the information was. Lomilomi is intricate and beautiful. We can’t be expected to learn it all in a week, but we were given insights into the physical, mental and spiritual aspects of this art. We were also given a well-rounded experience that could be incorporated on a personal, individual level with ease and grace. What I received on a personal level was incredible. I’ve never been in a situation where I got so much…where I gave so much…so freely and continuously, where every day I was pulled out of myself, to go outside my comfort zone, to help others and be helped in turn. I’m still flying high from this trip! I’m so grateful to you for all the time and work you put in to create this lomilomi training and make it such a wonderful experience. My massage has become more flowing and solid. I know I can deliver a wonderful massage drawn entirely from my learning during this week.” Suzanne B. “This course has reawakened the spirit within me. On a professional level I have gained more skill in a much more meaningful modality than basic massage. All that I have learned will most definitely be useful to me in my practice. Wood Valley is an awesome place to be. The food was absolutely amazing!” Roy V.
“I want to be known for my lomilomi techniques to my clients. 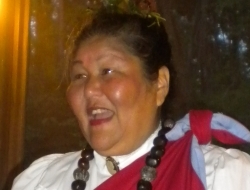 I intend to educate people in the Hawai`ian way. The information in this course has raised my spiritual awareness. I experienced significant shifts in consciousness. 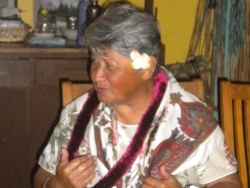 In order to assist people with healing, I must first be more conscious myself.” Becky M.
“Aloha. I had the most amazing time. I felt you were extremely organized with your presentation of material. The packets you gave us the first day were well done and very helpful. I liked knowing what we were focusing on each day. I also appreciated your willingness to be flexible. I have already incorporated so much of what we learned into my massage work. I have the Hawai`ian prayer in my office and try and recite it before every massage. I would not have changed a thing. Wood Valley retreat was magical and nourishing. The food was beyond amazing. The company perfect! You are an inspiring teacher. Thank you so much!” Dianna A. “When people ask me about my experience at the retreat, my response is that it was far and away beyond my expectations. I am incorporating lomi in most of my massages. I love it and my clients love it! I know I will benefit from both the instruction and the experience for many years to come. 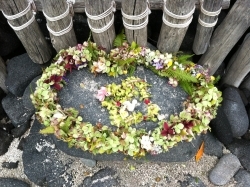 Thank you, Kolleen, for sharing so much with us.” Ami R.
“The Lomilomi workshop was one of the best I have attended. The organization and presentations were superb. The handouts and printed materials were all presented with history, informational knowledge, and were a labor of love. The accommodations at the melodic Wood Valley, plus the ‘more than excellent chef’ made the food and lodging so enjoyable. What a body, mind, spirit experience ~ a real retreat. I think every one of us leaving the workshop is enriched with new skills in our massage from the Hawai`ian healing arts. 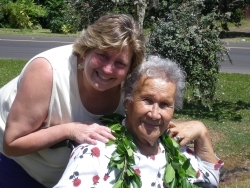 You combined the best of Aloha with your knowledge of the healing arts to make this workshop a very memorable experience.” Angela T.